Just a short distance from Hisarönü, is the newer resort area of Ovacik, which is essentially a collection of hotels and apartment buildings, blending in with the stunning mountain scenery. It is more peaceful than its neighbour, and all facilities are in the centre of Hisarönü just a short walk or dolmuş ride away. Ovacık makes a good base for those who want to walk in the surrounding countryside. Ovacık is located 4km from Oludeniz. Cool breezes and beautiful mountain views enchant those staying there. Located at the foot of Babadag mountain, there is always a refreshing offshore breeze even in the hottest months. This resort has plenty of cheap accommodation from budget hotels to affordable apartments. There are a growing number of bars and restaurants along the main road leading to Hisaronu. Ovacık is great for people who want to be close enough to the nightlife to enjoy it, but prefer to retire to more quiet surroundings to sleep. 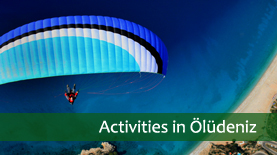 Hisarönü is situated between Oludeniz and Ovacik and is 450 metres above sea level so it benifits from fresh mountain air making it slightly cooler than Oludeniz. This is by far the most lively resort in the area. Fifteen years ago there were only a few houses here but now it is a lively resort in its own right. Due to the planning restrictions and lack of space to expand in Oludeniz itself, many holidaymakers now stay in this lively village. It is in a stunning location, surrounded by stunning pine-clad mountains, and hotels are all built in the local style, low rise, mostly with rooms set in villa-style blocks and decorative wooden balconies. 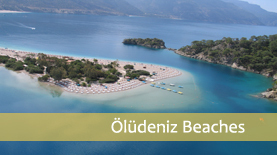 The beach of Oludeniz is just a short dolmuş ride away (approx. 15 minutes), and the town of Fethiye is also very close, approximately the same distance away in the opposite direction. You can, however, easily spend your time in Hisarönü , lazing by the pool, and venturing out at the night to sample international or local fare in one of the many restaurants or visit its lively bars playing music well into the early hours. There are plenty of shops with a wider range on offer than in Oludeniz itself.